I also spent some money on myself as I needed a down-filled jacket for work. It can get very cold at my work station and it's not even winter yet. So after much searching I bought one, on sale of course, half price, but still $100.00. I didn't get down-filled, either, just fibre-filled. The down ones weren't on sale anywhere and were more like $300.00 and I just couldn't justify it. I did check my favourite boutique,Value Village, first but they didn't have anything suitable. The jacket I got is light weight so I can wear it while working away and it looks good on me so I guess it was worth the price. As I said, it can get very cold in my work area and this chicky-poo doesn't plan on freezing her booty off. I also bought myself a small heater for under my work table. I can handle the heat in the summer but not the cold in the winter. So I'm as prepared as I can be. I'm gearing up for Halloween. 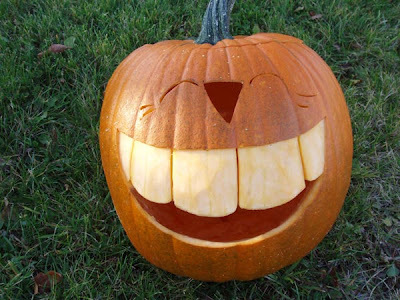 This Friday Hubby and I have the day booked off and we will begin to carve the pumpkins. I'll probably make some kind of cookie or cupcakes and roast some Devil Seeds (spicy pumpkin seeds). I love to bake near Halloween. Maybe it's just the cooler weather but for some reason it just brings out the creative side of me. Oh, the IT Department finally got some sidebars up for me. I still haven't decided what they should show yet but at least they're working although only in a testing format. Hope you like the pictures and I'll try to post again before Halloween. 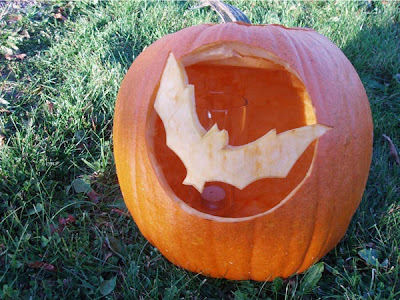 Did you carve the pumpkins yourselves? They look great! Yes we carved them. They are just two of the seven we did last year alone. And just wait till I post some of the other pumpkins we have done in the past 25 years that we have been carving. Putting the Garden to Rest. I'ts October, my favorite month.